“Because I knew that the small stuff is what destroys a person. Only with Angel, nothing was ever small. Even the littlest things were mountains in her mind. She would sweat everything and the more her troubles piled up, the more I felt the need to drive them away because just watching Angel try to deal with stress was painful.” – Avery (Kindle Locations 3011-3014). Angel Patel is in jail for something that her best friend Avery did, even if she’s indirectly at fault. It has been six years and Angel has slowly come to terms with being behind bars, because she blames herself for what happened. During another one of her case reviews, the story and the fascinating twist will come to light that may even surprise Angel herself. Angel was in love with the singer of Analog Controller. He was older than her, but they were meant for each other. Angel’s life was never easy before falling in love and still has its bumps in the road. Growing up in foster homes and knowing the ugly truth of how she got there causes Angel to reach out and she grasps hold of Avery. They become friends and protectors of one another, but Avery will eventually be the bad seed that leads to both of their current situations: incarceration. The author’s descriptions, though they were narrated in the author’s playback as information to the reader and not live action, were very well articulated and quite vivid. For example, “The whole place smelled like the smoke machine was set to kill—a fog of cat litter and ammonia that burned my retinas.” (Kindle Locations 522-523). I really enjoyed the writer’s way of describing the world, even if it wasn’t coming live, similar to the setup in if I stay by Gayle Forman. Since most of the action is told in flashback/playback format, much of the focus of the narration is on internalizations and thoughts and regrets and remorse, the characters thinking back to the “events.” Even so, most of the story is centered on the characters themselves more so than the events that happened and the descriptions of the events. The story is made up of Angel and Avery, with Jake and a few others thrown in. It is centered on these two girls and their intertwining stories. Rivera also employs perspective switches between Avery and Angel, separated by chapter and it’s neat to get both point of views in the story. Interestingly enough, though both gals are in jail, you want to sympathize with one and blame the other, you just don’t know which one is guilty yet. As the story progresses and the girls reveal more about themselves and what happened, you feel both more sorry for them and you like them less for what they did and how they reacted. The story gets a bit hot and steamy at points so be warned. 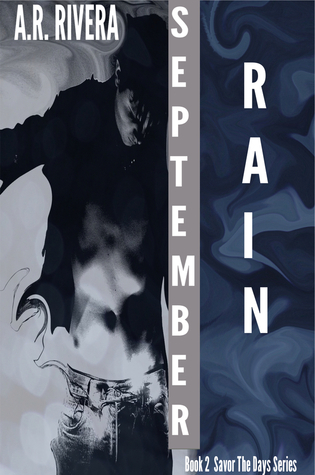 If you liked “if I stay” by Gayle Foreman and the dramatic buildup without too much present day action, then you’ll love September Rain. This novel was published by Amazon Digital Services on May 5th, 2015 and is available on Amazon here. I am reblogging the great review of my second novel, September Rain . . .